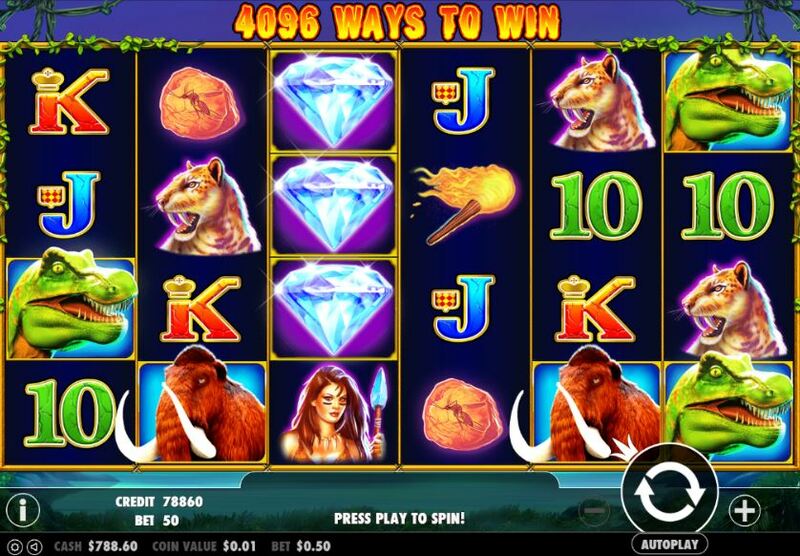 Jurassic Giants slot is a giant in both the mechanics and theme. I can begin by saying it's a hybrid game based on two highly successful formulae: the Jurassic subject made famous by Microgaming with slots such as Jurassic Park and Jurassic World and secondly the 4096-way 6-reelers of which Raging Rhino and Buffalo Blitz are the best examples. Jurassic Giants is a blend of ideas which is great for the player if the game can look original and not a 'clone' and in this case Pragmatic Play have produced something special from the ingredients. These giants had large teeth and were the undisputed kings of this period, but ultimately suffered extinction - will the same happen to your bankroll? We pay 50 coins a spin and as a result of the 4096-ways have 6 reels of 4 rows each. 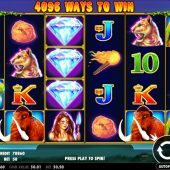 You get stacks 2 or 3 rows high of the top two icons which are the T-Rex and Mammoth and those pay 8x bet for the full 6-of-a-kind win. The rest of the icons appear as singles although two can appear on the same reel and these are the Huntress and Sabre-Toothed Tiger at 5x bet, the Amber and Torch at 4x bet with five card values offering 3 down to 1.6x bet for a full way of 6 symbols. And I bet you never guessed that this game pays right-to-left as well as the usual left-to-right? Aside from the both-way pays so far this may all sound familar, especially when we realize the single Wild only appears on the middle four reels and the reels spin with similar music to the soundtrack of the various Jurassic films you may have seen at one time or another. The background to the game is unsurprisingly a Jurassic jungle landscape and they've even managed to include that waterfall off of the mountainside that, er, you may have seen before. I suppose next you'll even be expecting me to mention the appearance of Diamonds on the reels too? Well, it's funny you should mention Diamonds as there are a hell of a lot of them on Jurassic Giants - stacked 4 rows high on all reels and this is where the game really comes into its own. You need 10 or more to trigger 15 free spins. If you get 11 though you will see 20 free games, 12 for 25, 13 for 30 and so-on up to 17 for 50. Now hit 18 Diamonds and an awesome EIGHTY free games are won. Still not happy? OK, get 19 for 100 free games! Listen, don't be greedy, why would you want 20 or more Diamond scatters? Well believe it or not you would earn an outrageous 250 free spins. Honestly. You retrigger the spins in exactly the same fashion as you earn them too, and that's not all. The Wilds on the middle reels do not multiply on Jurassic Giants - because they don't need to. Every single win landed will see a battle between the T-Rex and Mammoth above the game and the outcome will be either a 2, 3 or 4x multiplier for that win.